Аннотация к книге "The Works of Samuel Johnson, Ll. 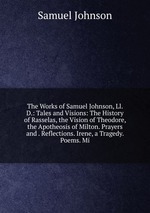 D.: Tales and Visions: The History of Rasselas, the Vision of Theodore, the Apotheosis of Milton. Prayers and . Reflections. Irene, a Tragedy. Poems. Mi"